1. Use the minimum of utensils and keep your ingredients list reasonable. I have a habit of making a huge mess of the kitchen when I am cooking, and with 6 mouths to feed, the kitchen can look like a bomb site quite easily. I have got cup cake making down to a fine art with only my mixer, a cup, a dessert spoon and a knife at the ready. I use no bowls whatsoever and just put everything straight into the mixer. Use the best ingredients you can afford. It does make a difference. 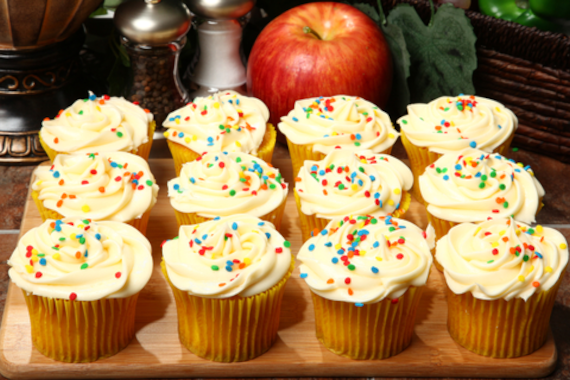 The quality of flours can be quite different when you have your finished cup cakes. If you’re using chocolate, use real chocolate and not the cooking kind that nobody really likes. For chocolate powder, splash out on something like Green and Blacks Cocoa powder and not cheaper versions with fillers, and you’ll be very glad you did. Use unsalted butter instead of margarine. I really don’t understand the margarine or spread brigade as I’d rather have a little less of the real stuff than a heap of manufactured fats full of additives and other difficult to pronounce ingredients. Baking really is a case of getting the mix of ingredients right. As long as you add butter, sugar and flour at the same proportions and 1 egg for each 120g of any one of the other ingredients, you should be fine. How much to mix is always a big issue with cup cake chefs. I do have my mixer on at a fairly low-speed for a couple of minutes and then I turn it up high for the last little while at the sugar and butter stage to try to blast some air into the mix. I’m going to go completely against the grain here. Sifting the flour in can add extra air, but I suspect most home bakers don’t bother. I am not telling you that I actually follow the rule for sifting flour into the mixer, as there are times when I don’t. I’ve never had complaints from not sifting and my cakes seem to be as light as when I do sift, but I can often hear my grandmother in the background nipping my ears for not doing it right. Guilt will sometimes make me reach for the sieve. If you’re really brave like my sister-in-law, you can throw everything in the mixer at the same time and just mix until it’s ready to spoon into cases. 5 – Get the mix even in the cases. This one is common sense. If some cases have more mix than others, some will be cooked more quickly than the rest. Try using a standard sized spoon or scoop to get the same amount of cake mix in each cup cake case. 6 – How to know if it’s mixed. The consistency should be creamy and not like Scottish Tablet with a grainy consistency. 7 – Work your oven. It takes a while to get to understand a new oven. Each one works differently and gives different results. If you know your oven tends to run hotter or colder than recipes usually ask for, change your baking time. Use a skewer to know when they are ready. If a skewer comes out clean, then the cakes are ready. 8 – It’s disaster time..
Cakes that don’t look perfect are rarely a disaster. Make a form of Eton Mess using the sponge, or change a bread and butter pudding recipe, or cover it all up with icing. If it tastes great, then it doesn’t matter what it looks like. « Baxters Beetroot – Stir Fry and Chocolate Brownies. great tip! I for one will be trying these out as im curious as to the outcome, my methods are slightly different to this. Thank you for the great tips… I’m guilty of not sifting but getting more disciplined the more I bake ! And agree totally about ovens are all different, my second hand new oven took awhile to get used too as it seems to take longer than what most recipes call for. Thanks for sharing, only trouble is…. my mouth is now drooling for cupcakes. Now that’s naughty, lol. A good post, as usual! Thanks, I know you do cakes. I did give up with the cake in a cup. Yours was far more successful than mine.